All our products are formulated from naturally derived ingredients ensuring wholesome, clean products. Our water based products that do require a preservative is preserved from silver ions and citric acid (fruit based). A harmonious synthesis of nature and science. Our products are paraben, sulfate, and phthalate free. Our products are naturally derived, meaning synthetic colorants and dyes are forbidden from our products. Any colors found in our products are created through clays and fruit. Our products are only scented with natural fragrances. We use essential oils, absolutes, CO2, and natural aroma oils. Natural aroma oils include the natural essence or extractives obtained only from plants and contain no pesticides, synthetics, animal sources or allergens. At Sanara we love our furry friends just like our conscious consumers do. Trust, knowing that NO product has been or ever will be tested on animals by us or our suppliers. All our products are tested only by us and our non-furry friends and family. We have taken a stance with Leaping Bunny and operate by the Leaping Bunny Standard. Blueberry and Bilberrys are packed with Vitamins. Vitamin A helps reduce the appearance of wrinkles and dark spots. Vitamin C helps neutralize free radicals and helps fight the appearance of premature aging. Pomegranate was recently included in the elite group of super fruits. It helps the skin retain moisture and hydration. They are full of ellagic acid, an antioxidant that has shown promising results in reducing the appearance of wrinkles. Acai is a antioxidant powerhouse due to it being high in Vitamin C. It can help protect the skin from environmental aggressors and reduce the appearance of ageing. A 2006 study conducted by the Journal of Agricultural and Food Chemistry found the acai berry had by far the highest oxygen radical scavenging activity of any food measured to date. Also, research by Fowler et al (2010) found the acai berry to be one of the most beneficial natural ingredients for reducing the appearance of hyperpigmentation. Green Tea Extract is a herbal derivative from green tea leaves. The cardinal antioxidative ingredient in the extract is green tea catechins (GTC), which comprise four major epicathegin derivavatives; namely, epicatechin (EC), epigallocatechin (EGC), epicatechin gallate (ECG), and epigallocatechin gallate (EGCG). Other components include three kinds of flavonoids, known as kaempferol, quercetin, and myricetin. These components have cell-protecting function as well as strong antioxidant effect that protects the skin from the damaging effect of free radicals. Argan oil is an oil produced from the kernels of the argan tree. We source pure Argan Oil, grown and harvested responsibly by Moroccan women. The tree, a relic species from the Tertiary age. Argan oil possesses a remarkable ability to nourish, moisturize and improve the appearance of skin elasticity. The oil is high in lipids including the omega-9 oleic acid and the omega-6 linoleic acid. We only source from the member of the Africa Fair Trade Council . Shea Butter is known especially for its cosmetic properties as a moisturizer and emollient. It's high in vitamins A and E. Its unparalleled hydrating property is due to natural moisturizers that are chemically similar to those produced by the body's own sebaceous glands. Perilla Seed oil is part of the mint family and is indigenous to Eastern Asia. It is high in omega 3s which help diminish the appearance of wrinkles. Perilla seed oil absorbs quickly and easily, leaving your skin hydrated without that oily feeling. Avocado oil is one of the richest sources of beneficial monosaturated fatty acids like oleic acid. It's extremely good at hydrating and softening your skin. The benefits of cold pressed avocado oil depends a whole lot on the presence of healthy monounsaturated fatty acids and Vitamin E.
According to the International Olive Council, olive oil has many vitamins, including A, D and K, as well as vitamin E. Olive oil has a very high concentration of an ingredient called squalene as compared to other types of fats and oils. The squalene is what gives olive oil the extra antioxidant boost. Research from the International Society of Bio engineering and the Skin has shown that Aloe Vera is an effective natural substance for improving the appearance of skin hydration. Aloe Vera is great moisturizer without leaving a greasy film and softens the skin without clogging pores. Due to its oleic acids Safflower oil is highly moisturizing and acts as a lubricant on the skin surface. It is a rich source of Vitamin E which is an antioxidant and moisturizer; it gives the skin a soft and smooth appearance. Using Sea Buckthorn oil daily helps reduce the appearance of wrinkles by nourishing the tissues in your skin and body. This wonderful oil has copious amounts of Phytosterol, Vitamin E, Beta-Caroten, Anti-Oxidants, and Carotenoid. 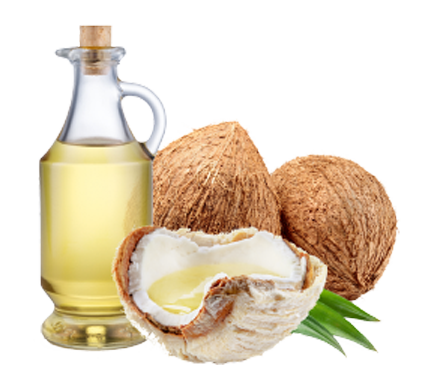 Coconut oil is composed of saturated fats that when applied on the skin keep it smooth to the touch. It also retains the moisture content of the skin as the fats eliminate moisture loss through the pores on skin. 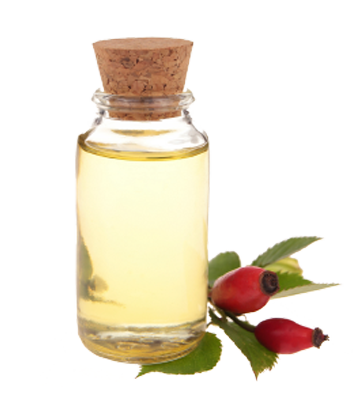 Coconut oil is also full of Vitamin E.
Rosehip Seed oil is harvested from seeds of rose bushes and is full of vitamins, antioxidants and essential fatty acids that can do amazing things for your skin. It's packed with natural beauty essentials like fatty acids and vitamins A and C. These ingredients help reduce the appearance of wrinkles and pigmentation and hydrate skin.